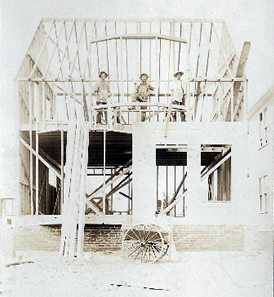 The family tradition of carpentry goes back 5 generations, to Charles Blank who immigrated from Germany in 1870, and followed by August, Julius and his brother Edwin, Marvin, and now Jim, the fifth generation of the Blank family in the carpentry trade. Blank Carpentry has adopted 22 Mile Road between Romeo Plank and Heydenreich and has sponsored the County Road cleanup twice a year for the past 15 years. Jim Blank is a Woodwork Merit Badge counselor for the Boy Scouts of America, and has hosted 22 Merit Badge one day workshops with over 113 boys earning their badges and learning about wood. He has also hosted 11 Eagle Scout projects. House construction in Mt. Clemens in the 1920's. Jim's grandfather Julius is on the left. The crew from an old fashioned barn raising ham it up for a photograph. That's Jim's grandfather Julius on the far right with the pipe in his mouth. This barn was built by Jim's great-grandfather August and his sons Julius and Edwin in 1916.